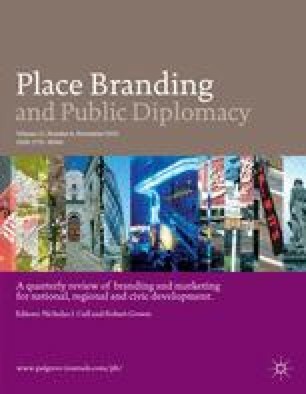 The purpose of this article is to evaluate (i) the segmented appeal of a town centre's separately branded environments; (ii) the role of digital signage in contributing to the atmospherics of a town, building on environmental psychology theory, drawing support from the Limited Capacity Model of Mediated Message Processing (LCM) and (iii) the segmented appeal of digital signage. The method consisted of a survey of actual shoppers (n=530) in a real shopping environment. Shopper market segments included demographics plus post hoc importance motivation. The article also evaluates shoppers’ perceptions of digital signage, that is, screens in a public place showing video. The study finds that separately marketable parts of the town have differentiated brand images and appeal to different market segments of shoppers. A modern mall appeals to younger, affluent consumers and includes digital signage, which appeals to these same market segments. Results build on environmental psychology theory, extending LCM from television to digital signage, confirming effectiveness as an atmospheric stimulus. Further research needs a longitudinal study to examine causality, other stimuli and contexts. There are two practical implications: (i) town centre and mall managers can separately position the brands of different parts of a town to better satisfy differing market segments of customers; (ii) digital signage is a recent addition to the atmospherics toolbox, with segmented appeal and future capability of adjustment of content for differing market segments. The research is original in that it (i) presents empirical support for significant differences between shopper market segments and their responses to marketer-driven stimuli; (ii) adds to understanding of psychological processes by which atmospheric stimuli increase purchasing behaviour, by adding digital signage to the short list of empirically supported stimuli and (iii) builds on environmental psychology theory, clarifying partial mediating effects of positive affect and moderating effects of age/employment status and shopping motivations. 3has established an international reputation in several management fields, evidenced by publications in journals, international conferences and textbooks. Newman teaches operations, strategy and retail on MBA/MA and executive education programmes at Salford Business School. He has served as a visiting professor at Missouri State University. He has a track record of research projects for EPSRC, Knowledge Transfer Partnership and commercial sponsors. Currently, Newman serves as a council member for the British Academy of Management (BAM), and is also chair of the Marketing and Retailing BAM Special Interest Group. The authors thank the anonymous reviewers for many helpful suggestions. The authors also thank the consortium of local government, shopping malls, education and business for a generous grant. Computerworld.com. (2008) Cisco enters digital signage market, www.computerworld.com, posted 16 January 2007, accessed 6 August 2008. Nadilo, R. (1998) Effective use of on-line research. Quirk's Marketing Research Review (0356), July 12(7) (available online from www.quirks.com, Article ID: 19980705, accessed 1 July 2010).